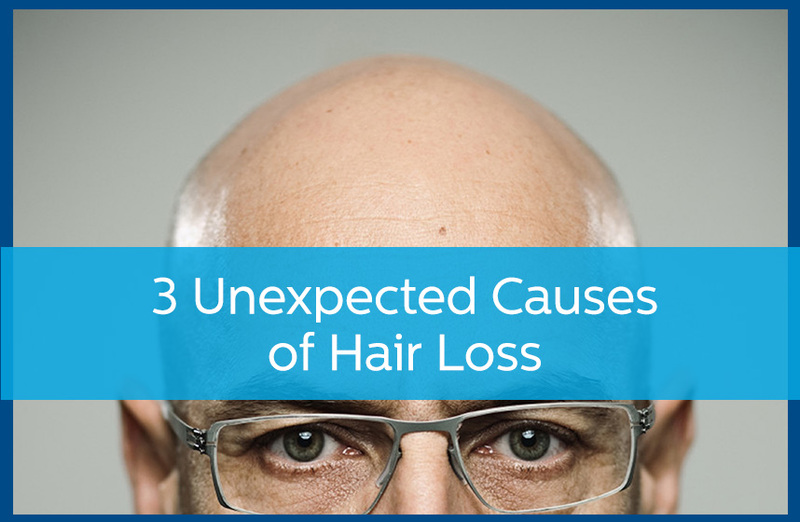 Hair loss is something we all live with. A hair normally lasts only two to six years, so this occurrence is perfectly natural, and in most cases, not something to be concerned about. So while excessive hair loss could indicate a serious underlying condition, most hair loss is just a natural part of being a human. This experience can deliver quite a shock to your body, sometimes physical and sometimes just mental. But in either case, your body experiences a kind of trauma it reacts to. This may trigger a form of hair loss called Telogen Effluvium, which can at times be diffuse and dramatic. More recently, a chronic form of Telogen Effluvium has become more frequent. In these cases, continuing everyday stress and anxiety, such a feature of modern life, may lead to a constant low level hair loss that over months may result in actual hair thinning. Fortunately, each form of Telogen Effluvium is not permanent and usually responds to time and if necessary, treatment. Alopecia Areata is a relatively common form of hairloss, seen often in children and young adults. There is a distinctive pattern in which small patches of hair fall out, leaving striking round bald spots. White blood cells mistakenly attack the roots of individual hairs causing them to go into a resting phase usually resulting in the hair falling out. Doctors are uncertain as to why it occurs in patches, but the good news is that with topical treatments, regrowth is common. Occasionally, much more severe cases, known as Alopecia Totalis, lead to loss of all hair. Until recently these cases have been very difficult to treat, but exciting new advances in immunomodulating drugs have led to hopes that even these difficult cases will be manageable soon. Any irritation that causes you to scratch your scalp can accelerate hair loss. Diseases such as eczema and psoriasis can cause itching that is quite insistent. If the scalp is constantly scratched, hair loss can result. In some cases, when the scalp rash becomes severe, just the inflammation of the rash is enough to trigger hair follicles to go dormant. In these cases, treatment to clear the rashes is essential in order to allow the hair follicles to start growing again. If you are suffering from hair loss, reach out to Avail Dermatology at 770-251-5111 for an appointment! Plantar Warts: What are They and How are They Treated? What is Causing that Finger Rash?